Just a quickie test in Python 3 (using Requests) to see if Google Cloud Vision can be used to effectively OCR a scanned data table and preserve its structure, in the way that products such as ABBYY FineReader can OCR an image and provide Excel-ready output. The short answer: No. While Cloud Vision provides bounding polygon coordinates in its output, it doesn't provide it at the word or region level, which would be needed to then calculate the data delimiters. The cloudvisreq.py script is included at the bottom of this gist. Tesseract (version 3.04 as of Feb. 2016), the open-source OCR tool currently maintained by Google, doesn't perform meaningfully in the photo of the road signs, but it is generally pretty strong in the case of screenshotted text. For comparison's sake, here is its output of the tabular data example -- unlike the Cloud Vision API, it does attempt to preserve some of the line layout -- and it has the option of providing HOCR output which can then be used to further define spatial layout. whole or in part by the listed service provider. 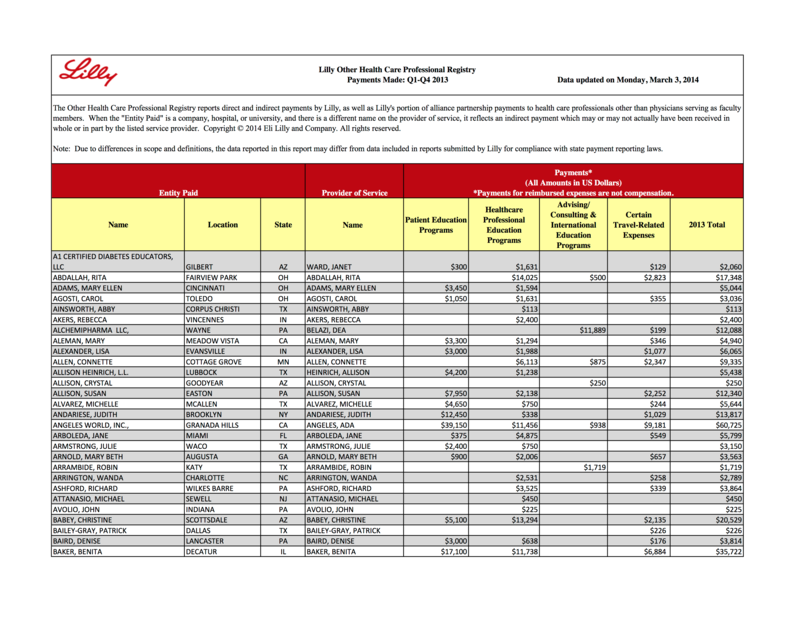 Copyright © 2014 Eli Lilly and Company. All rights reserved. Note: Due to differences in scope and deﬁnitions, the data reported in this report may differ from data included in reports submitted by Lilly for compliance with state payment reporting laws. "message": "image-annotator::RPC deadline exceeded. : Backend timeout!" It includes using the googleapiclient library, which has various conveniences including a num_retries argument. Thank you! This is so useful, and one of a handful of interesting work currently available for Google Cloud Vision. Nice write up. I'm trying to simulate what Google Books does with scanning books, because I have a bunch of pdfs. I was wondering if Google's Cloud Vision would be good for this, but apparently not. I'll try tesseract but I heard it isn't great for preserving page layout? Then again, OCRopus (which is what Google Books uses apparently) doesn't seem to do it either (based on my short amount of searching...). Hello, I am having trouble running this file. I got a couple of errors "Invalid Syntax for '*image' line 46" and " makedirs() got an unexpected keyword argument 'exist_ok'. I am new to python so this is a bit confusing for me. Also the api_key link is a dead link. This is great preliminary research. I'm thinking a less complex table would resolve the "Backend timeout!" error. A low-level test with 6 columns, 7 rows, and 1 header row with wrapped text provided similar (-/+ 5 px) coordinates for the beginning (top-left & bottom-left) of the column-based text results. The position of the header row text was not as patterned, because the text was centered prior to the image's creation - the bounding coordinates for the first column and last column could hypothetically create a frame, providing that the header row's height - which could be increased by a subsequent column's text (if wrapped) is higher or lower than the previous bounding coordinates. My hope is that small-sample-group statistical analysis would predict the position of the text within each cell, for each column and row - by grouping their bounds. Those bounds would then be used to identify the grid required to rebuild the table. Further interest motivates me to implement machine learning to assist in the identification of tables, rather than parsing an image such as the "road signs" example above, and identifying it as a table. I think you need to use python3 instead of python2. I got the same error with python2. I am trying to figure out a problem I am solving using the same API and want to know if there is a way if I can provide coordinates to the vision API to perform OCR on it? As my trained model generates bounding box coordinates of the ROI (Region of Interest) which need to be OCR'ed.